Mystery endings may be good for novels and movies, but they are definitely not acceptable for murals. Your comfort level during the entire project, from concept to the last brush stroke, is of paramount importance. Sometimes, I meet with a client that has a really clear vision of the mural they want painted. Bingo, I can get in their heads immediately and start seeing that vision through THEIR eyes. I will love designing it and being your mural painter, but in the end, it is yours, not mine. There are other times that my client is partially there. Through conversation and research, together we see the vision come alive. And then there are the challenges (and I love them! Bring them on). It may be tentative at first, the half finished sentence “I see something…I don’t don’t know what.. But indeed, they do know. It just takes a little longer to get the vision to come into focus. Once it’s time to put pencil to paper, more often than not, I take pictures of the area, print them out and draw directly on them so you can see the sketch in your home. Depending on circumstances, sometimes I make a mock-up, scaled to the room. I want you to picture it with your furniture. Through these I get to know you a little better. The ideas you favor stay. Those not so much are discarded. Once a direction is chosen, I prepare a detailed and scaled drawing for your approval. 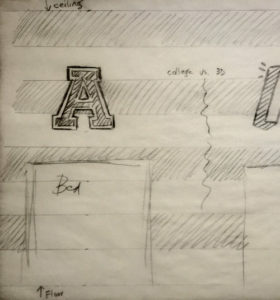 Below are two murals and the sketches used to design them. I want to be your mural artist. Click here to contact me so we can bring your vision to life. Myth: Murals are only for the more public areas of your home.Not true. The mural doesn’t know where it lives. It’s wonderful to have a mural in the areas of your home you share with friends. But think of your personal space as well… the master bedroom and bath or your office. 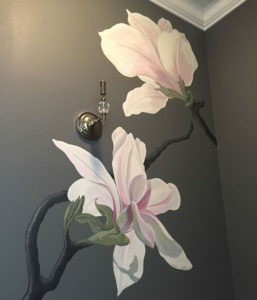 Myth: I don’t think having a mural painted is within my budget. Not true. Your mural solution does not need to be one that wraps around an entire wall. 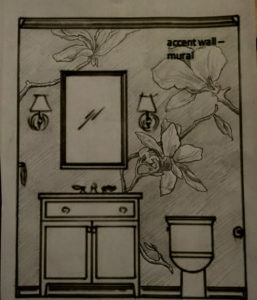 The options are endless, whether it’s a focal wall, a vignette or perhaps a “painted window” with your favorite scene. I am always respectful of my client’s budget. Combining design with innovation will keep the work within your budget. Myth: I may be moving. It’s not like I could take it with me. Not true. 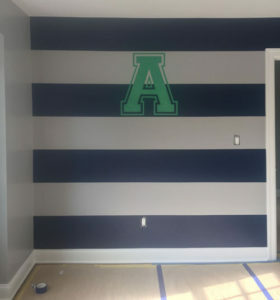 Murals can be painted on canvas and put up much the same as wallpaper. Easy to put up, and just as simple to remove if you relocate.